I’ve been dabbling in Spoonflower. I first used their services to create fabric with my kids’ drawings to use as lining for the Army Daddy messenger bag. I used them to print the Hawaiian themed fabric I designed and used those samples to propose the designs to several fabric and paper companies (nothing came of it, but it was worth a try). Part of the fun of Spoonflower is that not only do they provide a wonderful service printing custom fabrics, but they are also creating a community — and part of that includes fun weekly fabric contests. I was soooo disappointed that their Mixed Martial Arts Smackdown theme was just an April Fool’s joke — I was totally ready to design some kickboxing fabric and then use it to make a tote bag for my paddles and boxing gloves! But I digress. 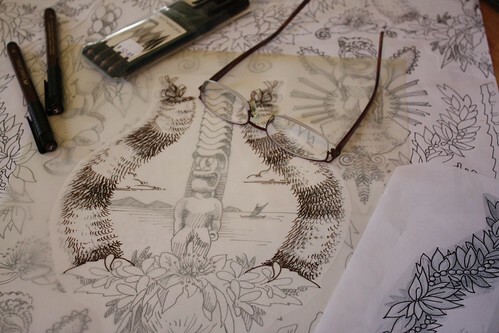 A while ago they had a toile contest and I thought, “how fun would it be to continue my Hawaiian fabric theme with a tiki toile? !” I didn’t get my act together in time, but I didn’t give up the idea either. Then, Spoonflower announced “Tiki” as an upcoming theme. Fate was telling me I needed to make the time to create this design! So here it is, Tiki Toile — from an alternate reality where the French colonized the Hawaiian islands instead of the Americans and English. Where tiki kitsch is early 19th century instead of mid 20th. 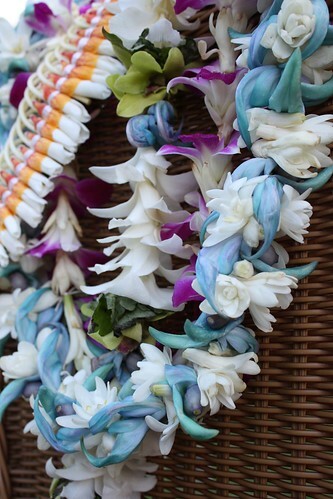 The tikis are roughly based on the Hawaiian gods Ku, Kane, and Lono, and are surrounded by plants, flowers, lei, and artifacts appropriate to ancient Hawai’i. Hopefully, one can appreciate the fun I had in combining such disparate art forms as tiki and toile and not take any more offense at my use of them than one would take at tikis in a mid-century beach shack party bar setting. I had hoped to have a picture of my actual sample fabric, but it hasn’t arrived yet. Please do take the time though to go vote for my Tiki Toile, and/or your other favorite tiki themed fabric designs over at Spoonflower! Please cast your vote by June 3rd. In an attempt to simplify my life, and focus my creativity, I made the decision a while ago to only enter quilt and textile shows that are either local, or prestigious to me in some way. With the exception of the Twelve by Twelve project and the occasional challenge that speaks directly to me, I steer clear of anything with a specific size or theme restrictions. So far, things are working reasonably well. I’m creating what I want though not quite enough to amass a body of work. I am happy to report that two of my houses and roots quilts, “Haleaina” and “Rooted X” have been accepted into the 2010 Tactile Architecture show (following on the tail of “Aquifer” currently on tour with the 2009 show). Now, I need to decide what to enter into Blurred Boundaries. It may not be a large show, but I was so impressed with how well my fabric collage and embroidery work fit in with all the other mixed media fiber pieces that I want to support the show again this year, if possible. The problem is, that the one I really wanted to enter, is, after some consideration, to big to mail. That leaves three smaller works. I keep putting off the entry process because I can’t decide what to enter. I decided yesterday that as much as I like one, it just doesn’t go with the other two, so it’s out if I enter multiple works. I decided this morning that this one below isn’t going either. It’s been bugging me for a long time and I think I finally put my finger on it. It’s too sweet and a little gimmicky for my taste. That leaves one, (or the other, since they don’t work as a series) to enter. Decisions, decisions. Ta da! Here’s the companion shirt to the party dress for Nonnie’s wedding. In contrast to Miss Sweetness who loves to pose for the camera, Mr. Impatient here was not into playing male model. He does, however, like his shirt. I can live with that. The Twelve by Twelve quilts are making their way around Australia, having debuted at the Australasian Quilt Convention and now about to be hung at Gosford Regional Gallery. Thanks to Brenda Gael Smith’s tireless work, we’ve also been featured in the upcoming issue of Australian Patchwork and Quilting (vol 19, #1), and, imagine my surprise when I opened up the June/July 2010 issue of Quilter’s Newsletter Magazine and saw our tagline on page 10 — news about Australian quilt shows! Our book is progressing. We’ve each written our chapters and submitted our photos. Now we anxiously await revisions from our editor. It’s a slow process, but hopefully well worth it. My MIL is getting married next month and my kids will most likely be part of the ceremony. It will be a pretty casual affair, and seeing as we live in Hawai’i, I thought it would be fun for the kids to have matching “Ohana Wear” (aloha shirt and mu’u mu’u). I found what I thought would work well, but by the time I returned to the store several months later, it was gone (darn economy). We checked some other stores, but realized that, duh, I could sew up exactly what we wanted. Katja rejected a more traditional ruffly-look mu’u mu’u for a party dress silhouette. The pattern (McCall’s M6020) had variations with sheer overlays, and a petticoat underneath, but I simplified it to just the basic dress. I really liked the integrated band and back ties, but Katja insisted that she didn’t want ties in the back. So, I skipped the band and made a separate sash that she can tie wherever she wants, or skip all together. The sash will make more sense when brother’s shirt is done, because it matches his fabric (he would have nothing to do with the purple fabric). You may remember that I bought this quilt as a top from Wanda about a month ago. I thought it would be weird to quilt and finish someone else’s work, but it wasn’t at all. In fact, it was really fun and as soon as I started working on it, I couldn’t stop. Firstly, Wanda’s workmanship is impeccable. All the seams were even and all edges and points aligned. There were no poufs to “quilt out.” Basting was easy-peasy. The quilt is not quite twin sized, so I was pleasantly surprised at how quickly it came together despite it’s being large enough to wrap oneself up in. 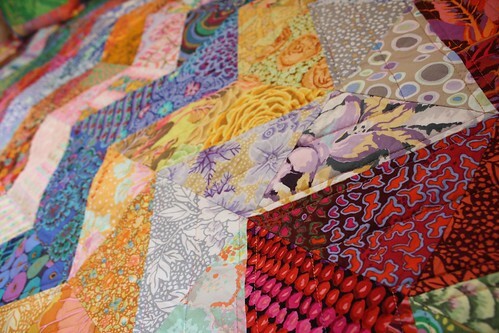 More significant though, was how the quilt revealed itself to me as I worked on it. Normally, I would already have a relationship with the fabrics from piecing them together. But since I didn’t piece this one, I got to meet each and every fabric and see how it interacted with it’s neighbor as I quilted. I enjoyed seeing how individual stripes modulated in color, and loved being surprised by each pairing that picked up on a hue in it’s partner. It was quite fun. 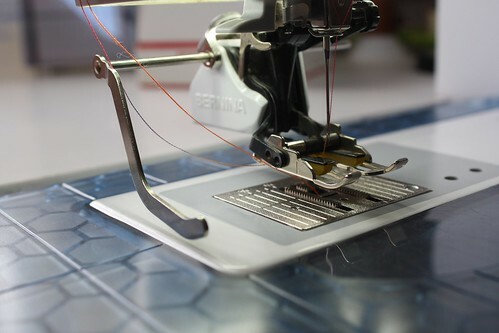 I don’t know how many readers are relatively new to quilting and it’s associated gadgets. I may be preaching to the choir, but here are two of my favorites: my walking foot, and the bar thingie that came with it. Walking feet come in several varieties depending on your machine, but they are all variations on this foot-with-box contraption. 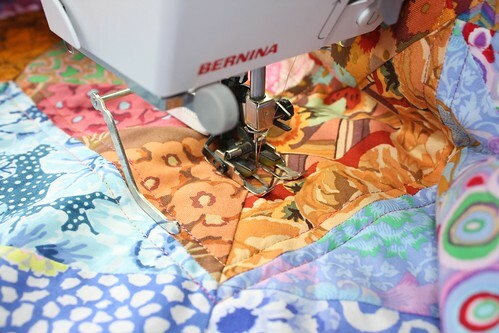 The purpose of the walking foot is to move the top layer of the quilt sandwich at the same speed as the bottom layer and thus eliminate lots of frustrating puckering. I do all my straight line machine quilting with my walking foot. 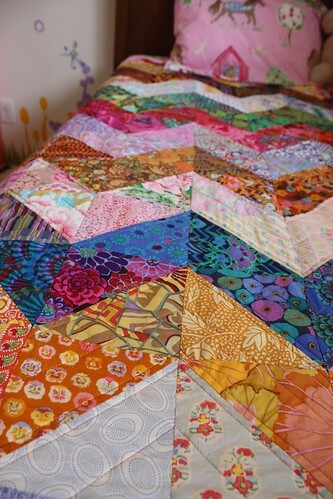 On this quilt, I kept the quilting simple, because really, with fabric like this, fancy quilting is just unnecessary. Often, I just use the side of the walking foot as my guide for stitching parallel lines. That’s how I did the first round of quilting 1/4″ from the edge of each zig zag. I wanted to quilt a line down the center of each zig zag too, so I used one of the guide bars that came with the walking foot. It is L shaped and slides through a hole in the back of the walking foot and is locked in place with a screw. You can adjust it so the “leg” sticks out anywhere from right next to the foot, to about three inches away. I also have another guide bar for the other side of the foot, depending on what I want to line up with. (As an aside, my machine came with another two guide bars that fit into the back of many of the regular presser feet too.) Once you get the hang of it, there’s all kinds of uses for these guides. I measured the width of my zig zags (4″) and set my guide bar two inches from the needle. Then, off I went, quilting down the center of each zig zag, making sure the leg of the guide bar followed the seam line. In the photo you can’t see the lovely line of stitching behind the walking foot, but it is perfectly parallel to the edge of the yellow zig. You can see that I am about to pivot the quilt and sew the zag (this is where the needle-down function on many newer machines is also very convenient). I considered more lines in between these, but the quilt didn’t seem to need them. It’s for a kid’s bed, so it didn’t need to be quilt-show-fancy. I love having a dedicated room to call my studio. It’s great to be able to close the door on in-progress projects, or just to throw stuff in there when I don’t want to think about organizing it. Every so often though, and usually when I’ve spent too much time away from my needles and thread, and regardless of more pressing projects, I just have to clean up. Somehow, the way to clean up the projects on the floor is to start a new one! I was frustrated with my big scrap basket and decided that what I REALLY needed to do was sort it by color. Ahhhh, I feel much better now and can move on. Actually, these are my lei from the quilt show reception, and the rest of the flowers below were for Lei Day, but since I didn’t post them then, they’ll do just as well now. 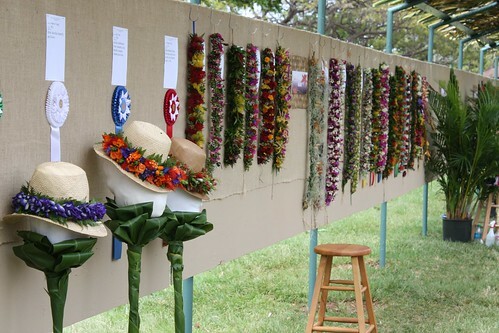 The highlight of the Lei Day festival is the lei contest where local lei makers compete for ribbons in several categories. Here are just a few of my favorites (so hard to choose!). I liked the bold colors (and thought of Deborah’s love for all things green and purple) on this one by Nikita Lenchanko. 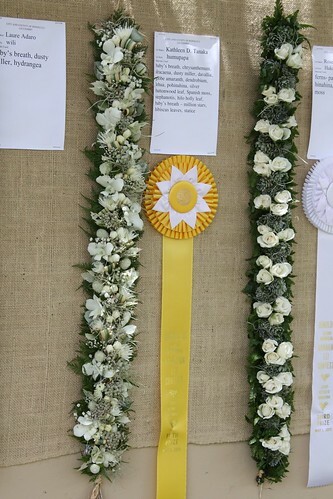 All the white lei were beautiful, but I particularly liked the one on the left by Kathleen Tanaka. Sorry, I didn’t get the name of the other one’s maker. Laure Adaro had several lei there and I liked them all. This one with larkspur was my favorite. Hot pink, by Randy Akau, for my daughter. Even kids were competing. This is one by Austin Dela Cruz in the 9-12 year old category was one of my favorites. 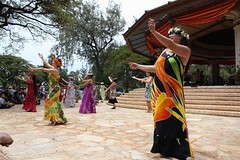 In addition to the flowers, there were crafts booths, food, dance and music. 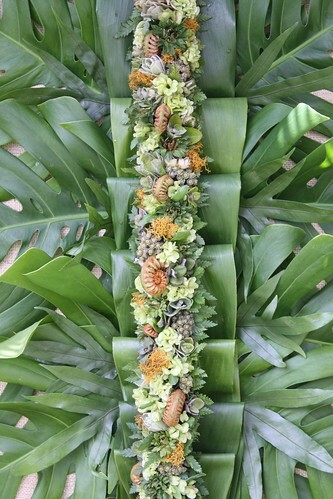 Oh, and my man Jason (of the beautiful luau), decorated the pavilion (though my photo doesn’t show it off at all — trust me, he did a wonderful job).